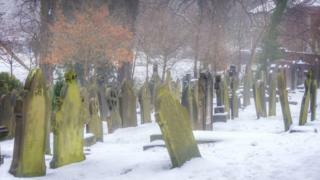 Image caption The NRS said the long-term trend for winter mortality rates was "clearly downward"
The number of deaths during winter increased last year in Scotland, according to the latest figures. The National Records of Scotland said 20,930 deaths were registered between December 2016 and March this year - up from 20,509 the previous winter. Despite the rise, the NRS said the long-term trend for winter mortality rates was "clearly downward." The seasonal increase in deaths fell from 2,850 in 2015/16 to 2,720 in 2016/17. That figure is calculated by comparing the number of deaths over the four winter months with the average of the four-month periods before and after winter. The number for 2016/17 was smaller than most of the previous 65 winters, but exceeded the level seen in five of the 10 previous winters. NRS chief executive Tim Ellis said: "There are always more deaths in the winter in Scotland than in any other season, but the long-term trend since the early 1950s has clearly been downward. "However, the five-year moving average (which smoothes out much of the year-to-year fluctuation) has not changed much since the early 2000s." Mr Ellis said there was no single cause of additional deaths in winter and that very few were caused by conditions such as hypothermia. He added: "The underlying causes of most of the additional deaths include respiratory and circulatory diseases (such as pneumonia, coronary heart disease and stroke), dementia, and Parkinson's, Alzheimer's and other degenerative diseases." Statistics showed 830 of the additional deaths in winter 2016/17 were linked to diseases of the circulatory system, with 330 caused by coronary heart disease, 230 from cerebrovascular disease and 270 from other circulatory system diseases. Meanwhile, 840 deaths were linked to respiratory system diseases, including 310 from influenza and pneumonia. A total of 460 additional deaths related to dementia, with another 250 caused by Parkinson's disease, Alzheimer's and other degenerative nervous system diseases. Taken together, these medical conditions caused 88% of the additional deaths in winter 2016/17, even though they were responsible for only about half of all deaths registered in Scotland.